New York Archives - Page 6 of 28 - Adventure, baby! As transplants to the glorious city of New York, we’re constantly seeking out fun new ways to experience everything NYC has to offer. 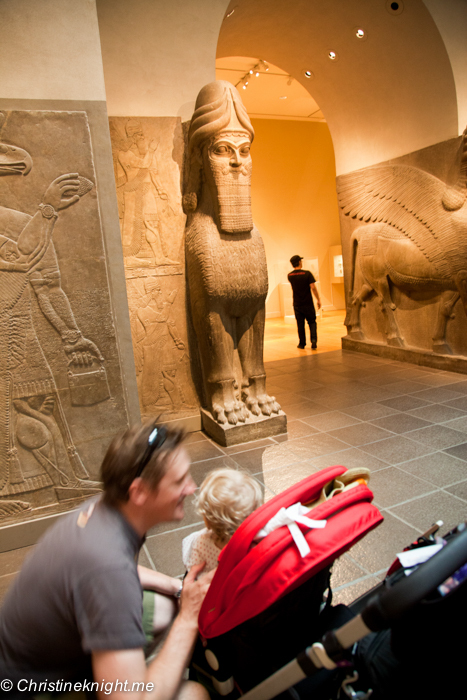 We try to balance obvious kid-centric activities with things that we, as adults, are interested in, such as the Metropolitan Museum of Art. 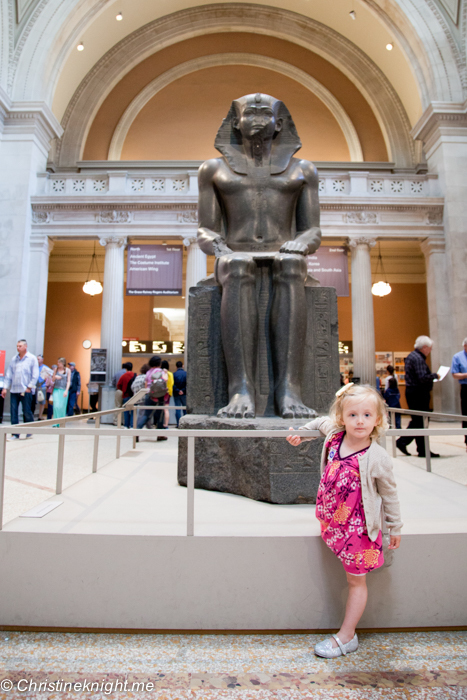 I also hope that exposing Missy E to art and culture will inspire in her an interest when she is older too. 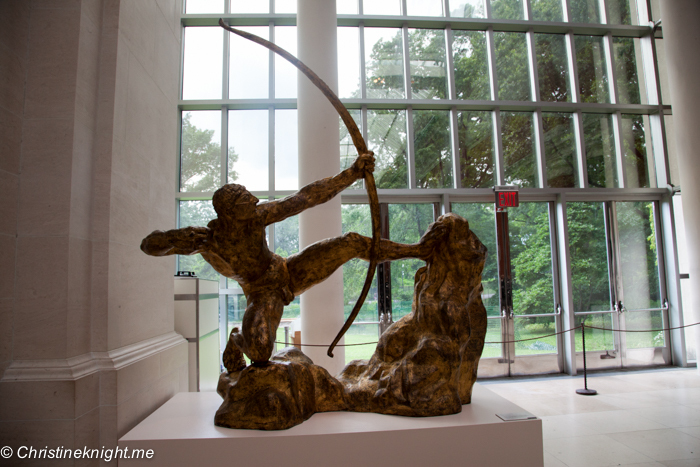 I’ve always loved art galleries in particular, and never get sick of visiting the grande dame of museums and art galleries, the Metropolitan Museum of Art (AKA the Met Fifth Avenue). 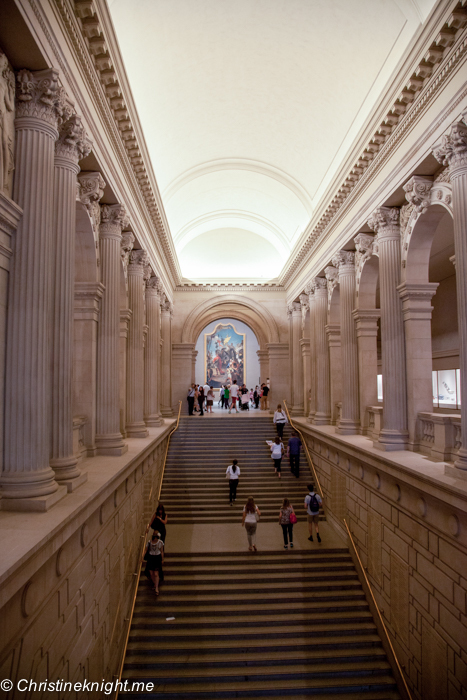 The Metropolitan Museum of Art, located on the eastern edge of Central Park along Manhattan’s Museum Mile, is the largest art museum in the United States and one of the world’s largest and most visited art galleries. With over two million works spread throughout seventeen departments, you could easily spend an entire day inside and still not see everything the museum has to offer. 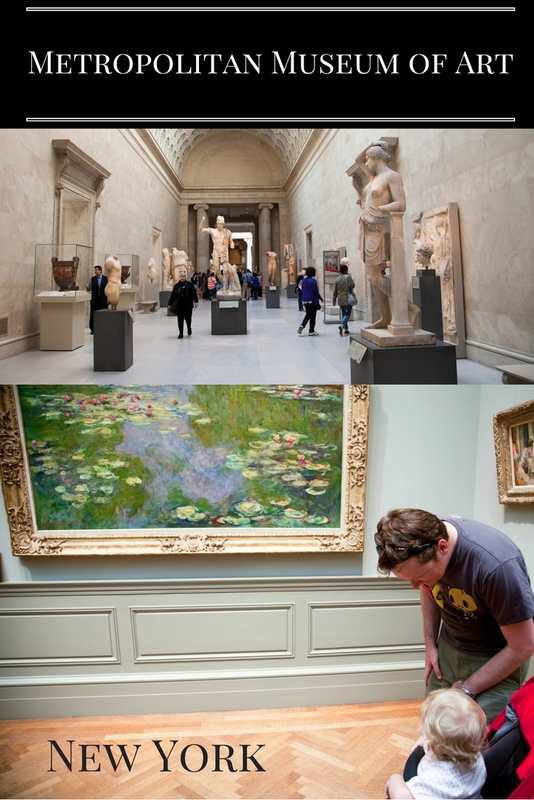 Founded in 1870, the purpose of the Met was to bring art and art education to the American people. 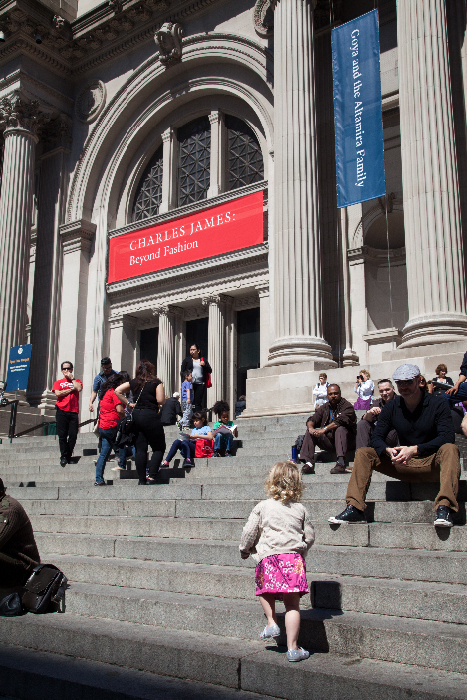 The Met Fifth Avenue has a permanent collection that spans over 5,000 years of history. 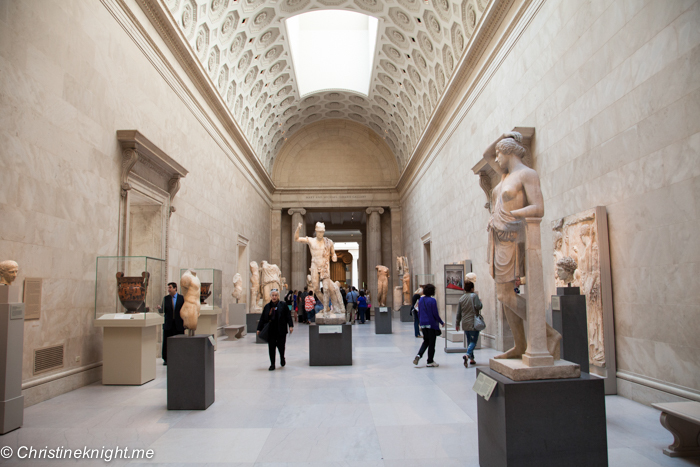 It consists of works of art from classical antiquity and ancient Egypt, paintings and sculptures from pretty much all the European masters, and a large collection of American and modern art. African, Asian, Oceanian, Byzantine, Indian, and Islamic art is also represented, and you’ll even find collections of musical instruments, costumes and accessories, antique weapons and armor. 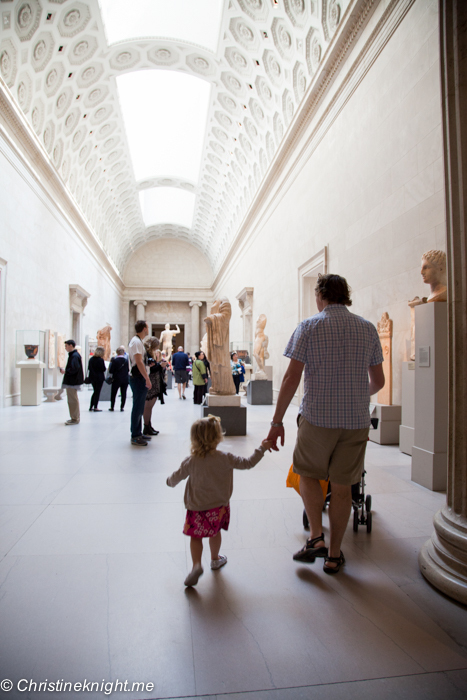 A favourite area of ours is Greek and Roman hall that is filled with classical sculptures. 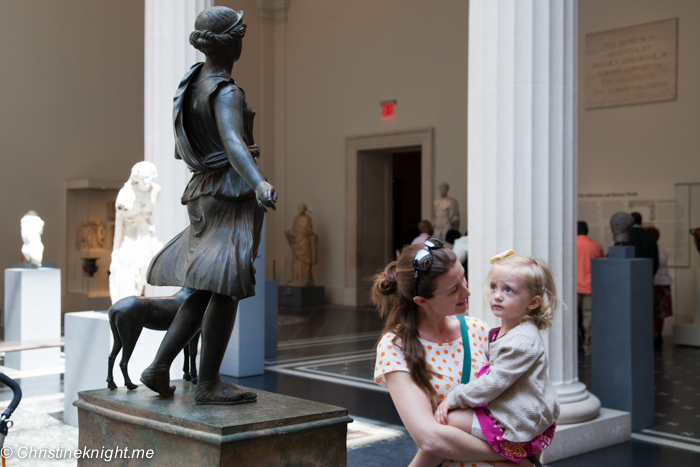 We pointed out things we thought she might be interested in, like animals or statues of people, and she was particularly concerned about the statues that were missing limbs or heads. 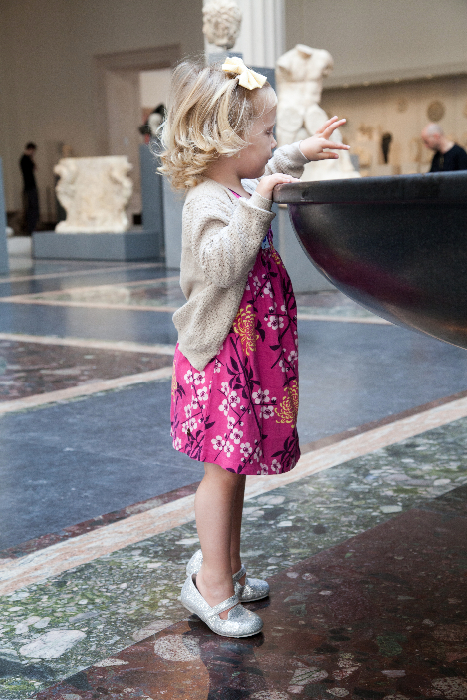 The fountain was also a particular favorite. 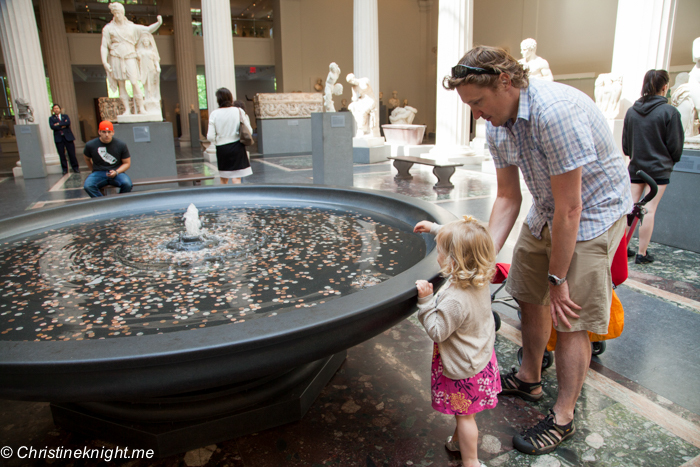 She was fascinated by the money in there, so we gave her spare change and taught her how to throw in coins and make wishes. “What do you wish for?” “The playground!”. Of course. “Anything else?” “Lions. And giraffes!”. Er, sorry Miss E. Wrong spot for those. But we will keep it in mind when we next visit the zoo! 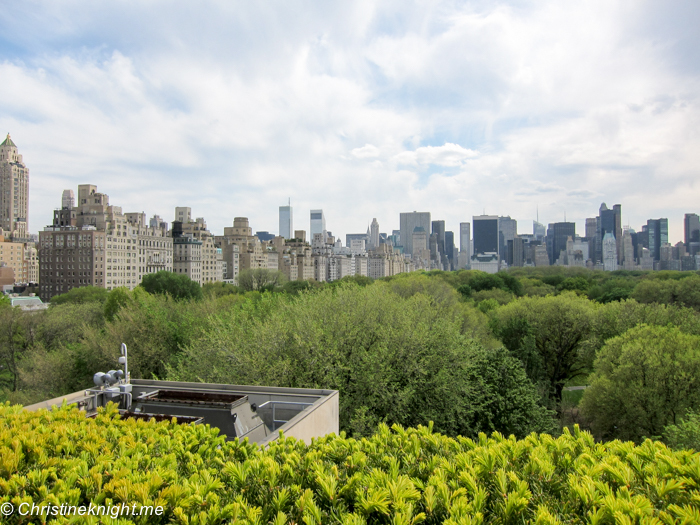 A must when visiting the Met Fifth Avenue is the rooftop garden. There is a special elevator that takes you up to the roof — ask for directions as you enter or you’ll be walking around in circles trying to find it. 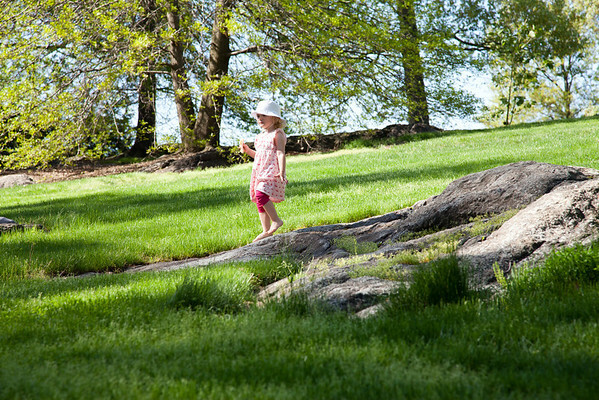 The garden is open seasonally, and offers spectacular views of Central Park and the surrounding buildings. 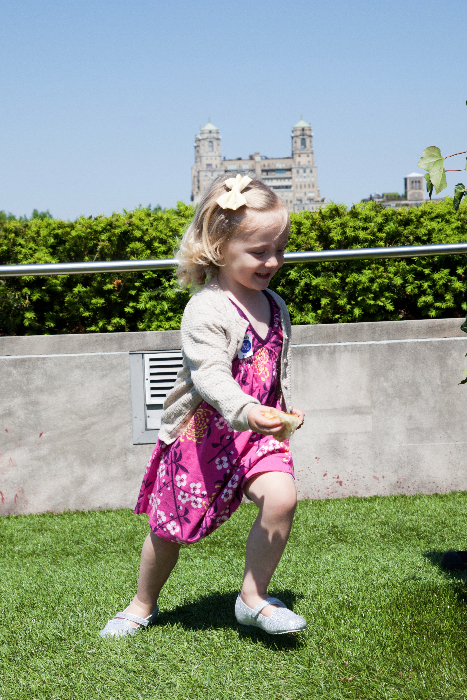 Each summer the rooftop garden opens with a new seasonal exhibit. 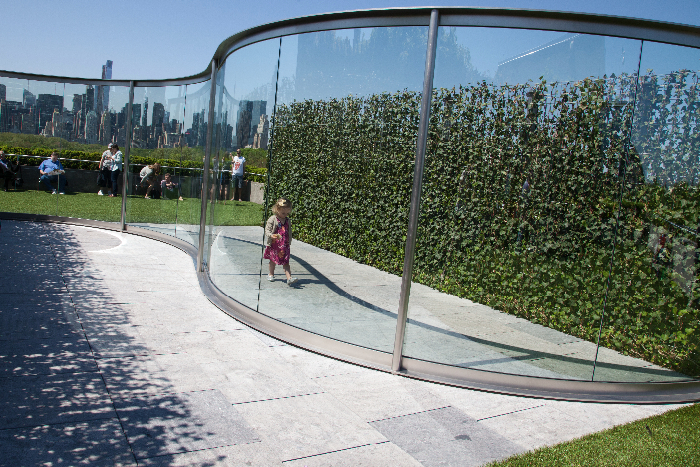 When we visited this time, the Roof Garden Commission was an installation by Dan Graham with Günther Vogt. 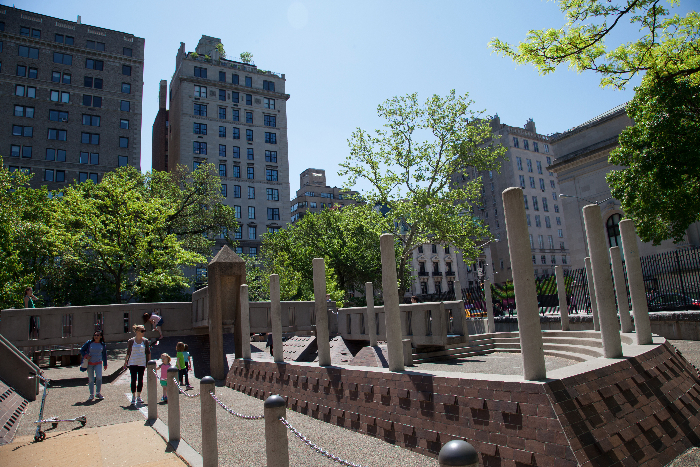 If you’re taking kids to the museum, be sure to stop by the Hecksher Playground next door afterwards to the Egyptian-themed play space. Hours: Daily, Sun-Thur 10am-5:30pm, Fri & Sat 10-9pm. The Alexis Silver Pediped shoes retail for $59 and are available on the Pediped website. Brunch With My Baby was provided with a sample for reviewing purposes. All opinions, as always, are our own. Is there anyone left who ISN’T worried about plastic, PBAs and other nasty things leaching into our food and water, particularly with young kids? After reading a particularly disturbing report on all the nasties that can be absorbed by children from their plastic bottles, dishes and containers, I’ve spent a lot of time researching what I can use with my daughter that will be safe for her. I came up with zoë b organic (I also love stainless steel water bottles, plates, cups and dishes). What makes the zoë b organic range different from other plastics out there? 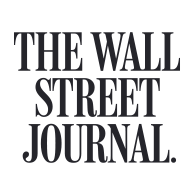 The focus for this company is on being as green as possible, which means making their sand toys and dish sets from a bioplastic derived from corn sugar grown in the USA. They contain absolutely no BPA, phthalates, or PVC. Their toys and dishes are manufactured in Pennsylvania USA, so you’re supporting the local economy when you shop with zoë b. The bioplastic used is also a renewable resource. While ordinary plastic comes from oil and natural gas — fossil fuels that are not renewable —zoë b organic’s bioplastic fully biodegrades in 2 to 3 years when buried in soil, immersed in water, home composted, or composted in industrial facilities (ordinary plastic takes up to 500 years to degrade). 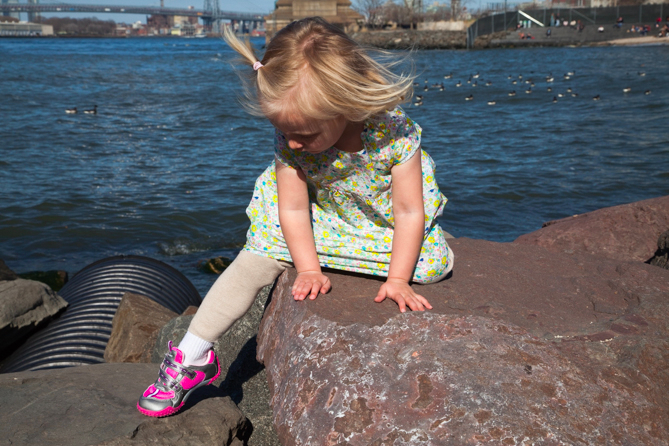 Zoë b toys are durable and designed to hold up to playing just like ordinary beach toys. They’re designed to withstand extreme heat (hello New York summer heatwave!) and endless sunlight, and are dishwasher-safe. The toys and dishes only biodegrade when exposed to microbial activity, such as in soil, home compost, industrial compost, or marine environments. When your kids outgrow the toys and dishes, if they’re not suitable to be handed down to another family, you can simply put them in your compost or bury them in your backyard. 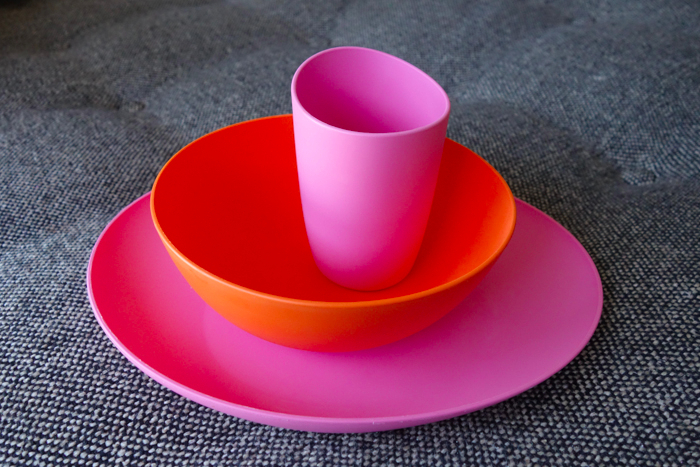 We received a set of the dishes, containing a cup, dish and bowl, and a set of the sandpit toys, both in pink/orange. 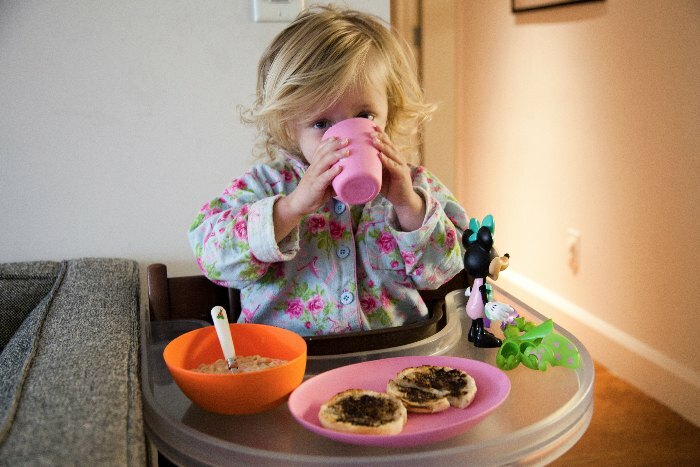 When they arrived, Missy E literally shrieked with joy and insisted on her dinner being served on the dishes (“and milk in my milk cup!”) and taking the sand pit toys into the bath with her. So tick off “instant hit with the kid”. I personally love the designs for different reasons. The cup is the perfect size for small hands to hold, and slightly sloped on the side to make it easy to drink from without excess spilling over the edge. The bowl is big enough for a big serving of cereal, and the plate is the perfect size for a large toddler dinner. 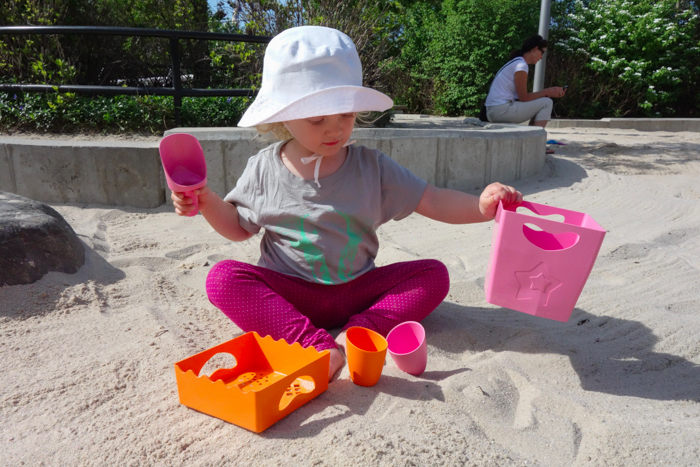 The sandpit toys are designed with function and fun in mind. 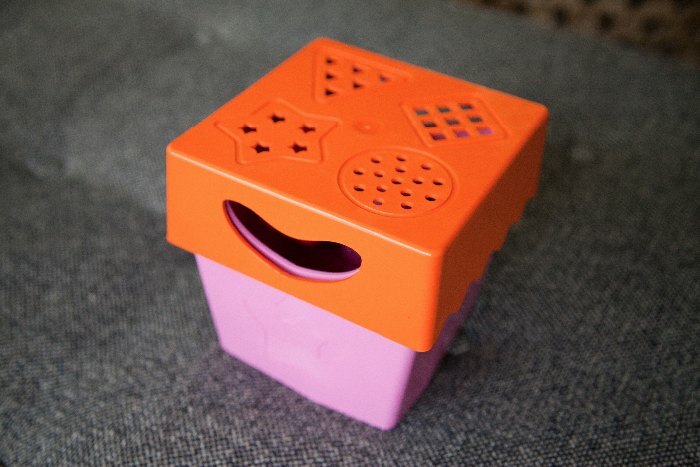 While most sand toys come in a bucket and fall out everywhere, this innovative set comes as a box with a lid and toys inside, giving you an all-in-one toy kit where the container is also part of the toy. The lid is a fun sand sifter with different shapes like a star, diamond, triangle and circle for the sand to fall through, and the bottom of the box acts as the bucket. 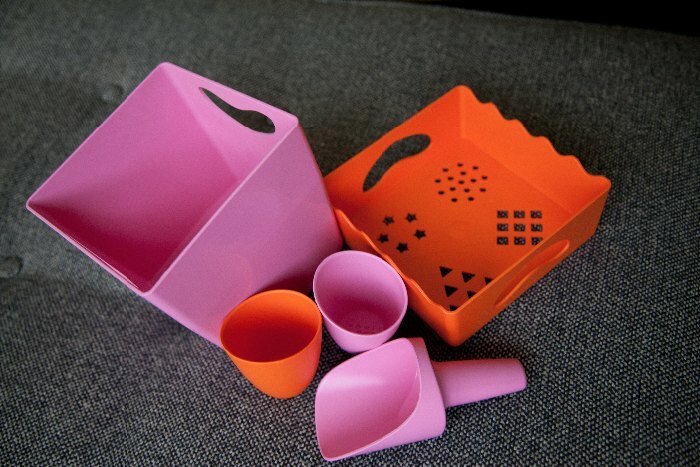 Inside are two small cups and a shovel — again, the perfect size for small hands, and also the perfect amount of equipment to either play with on ones own, or to share with a friend or two. The zoë b organic range is available for sale on here and here. The dish set retails for $13.25 and the sandpit toys for $22. Brunch With My Baby received samples of zoë b organic dishes and toys for reviewing purposes. All opinions are, as always, our own. 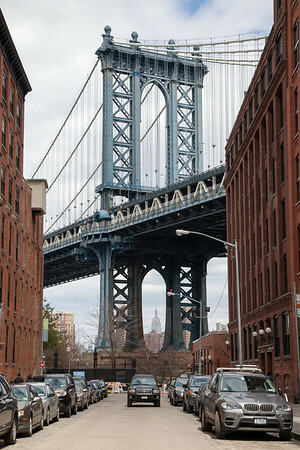 One of my absolutely favourite things to do is to just walk the streets of DUMBO. I did it a lot during winter with the Cheese to get her to nap, which wasn’t ideal, but it was still an amazing experience (even in the snow and sleet). 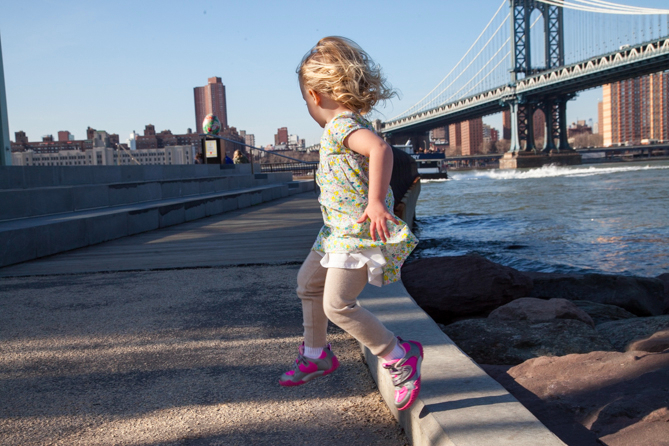 DUMBO stands for Down Under the Manhattan Bridge Overpass, and is a little old industrial neighborhood full of cobblestones, soaring bridges and, of course, stunning water views. 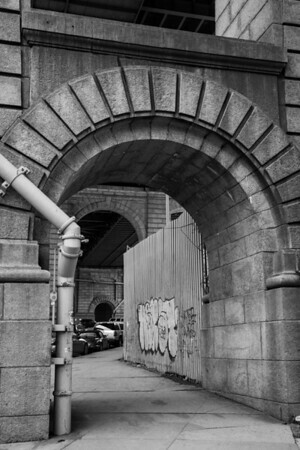 DUMBO was originally a manufacturing district, home to warehouses and factories that made machinery, paper boxes and Brillo soap pads. 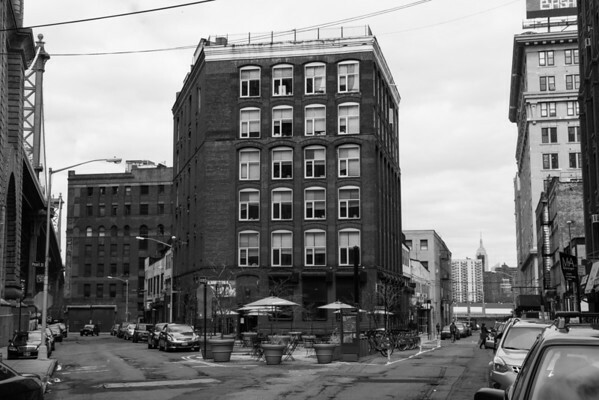 Interestingly, the cardboard box was invented in the Robert Gair building on Washington Street, which is now the home of Etsy. 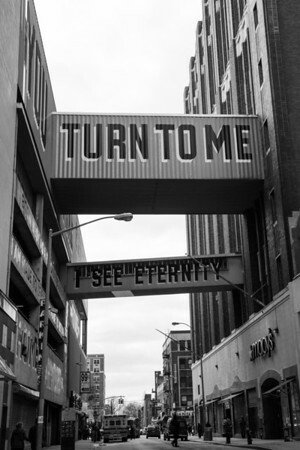 Nowadays, DUMBO is home to a lot of expensive condos, tech startups, little cafes and restaurants, like my faves One Girl Cookie and Jacques Torres, and the beautiful Jane’s Carousel. 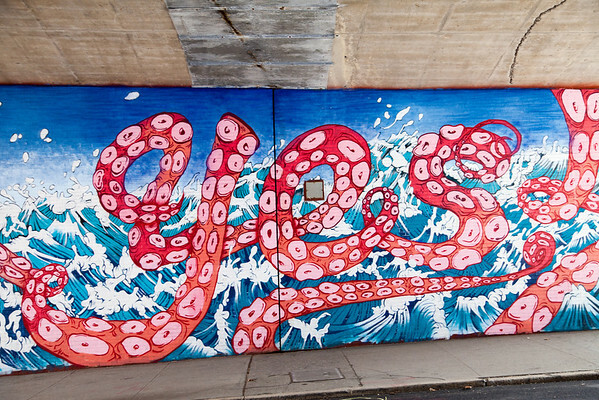 OK so this last one is actually in nearby Downtown Brooklyn, but I wanted to throw it in because I love it. Lunch at ABC Kitchen. Cheese slept well the night before, so we all had a lovely lunch – especially when the little one slept through most of lunch so we were able to enjoy a leisurely lunch and then share dessert with her when she woke. Alec had crab. 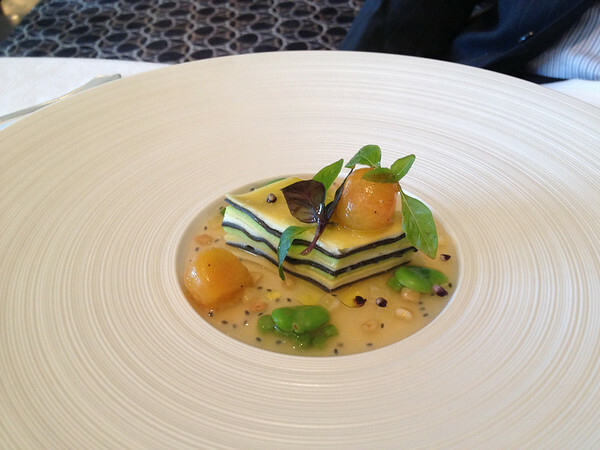 I had ravioli, and we shared really good citrus desserts. ABC Kitchen was really kid-friendly too, which was nice, even though Cheese was asleep the whole time! When she woke up, they set her a special place at the table. 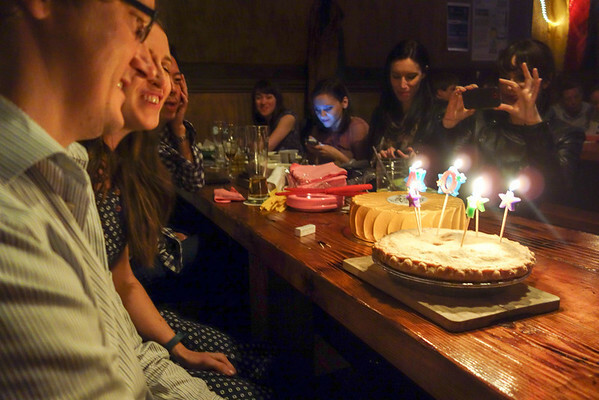 A party with friends at the KBH, Brooklyn. Nothing like beer, cake and pie with good friends. Pie and cake from Betty Bakery, Brooklyn. 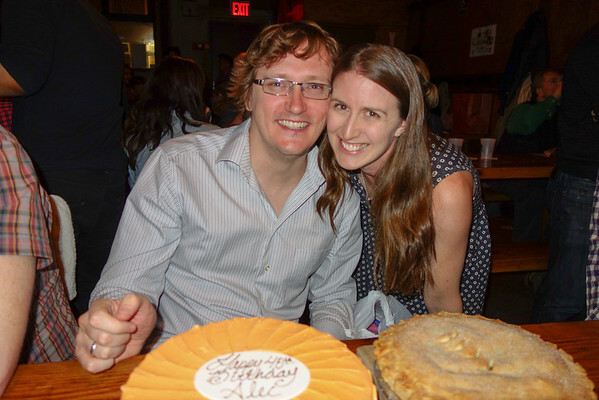 Alec wanted a pie rather than cake, so we had both to feed the masses. 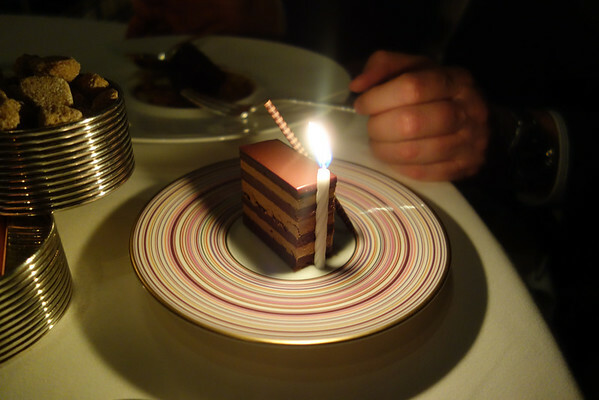 Candles on the birthday pie. Happy birthday boy. 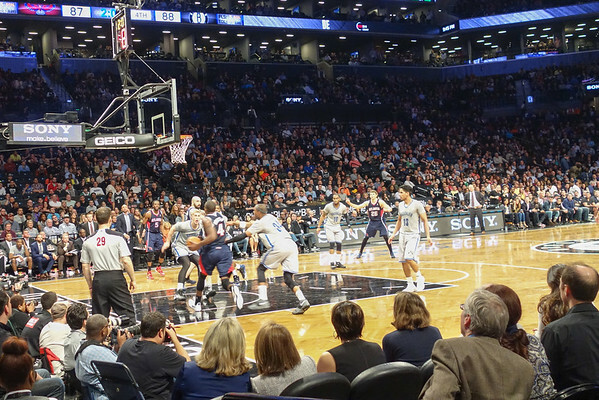 Awesome seats at a Net’s game at the Barclays Center – the Brooklyn Nets vs Atlanta. My first basketball game! 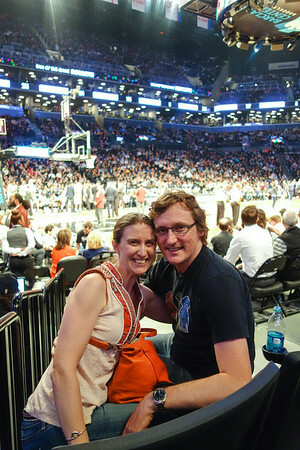 It was so much fun, both being so close to really see the players and the action, and the atmosphere. The view was amazing! Special seats for the birthday boy. The only celeb we saw was Katie Couric, but plenty of other fun things to watch, like the half-time entertainment and dancers. I also loved that our tickets included unlimited food. 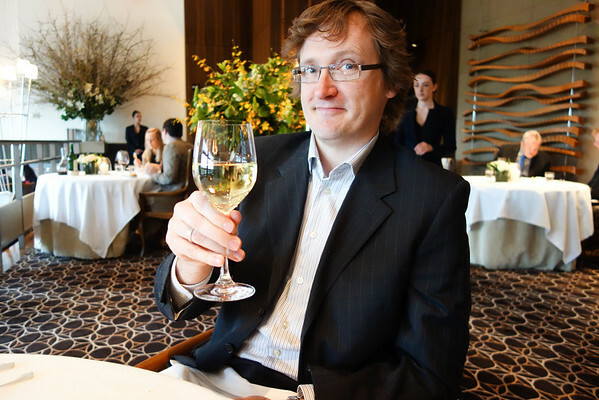 Dinner at Per Se. The most amazing dining experience of our lives. 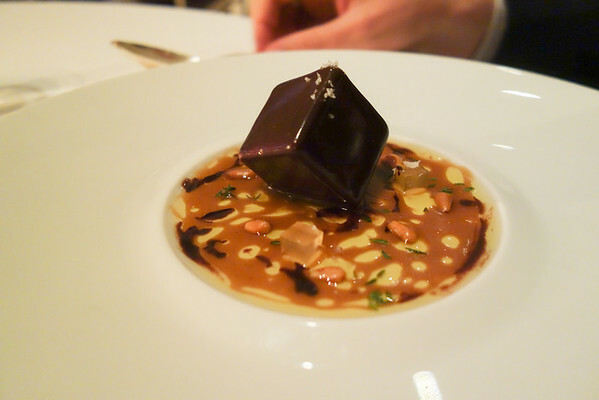 Located in the Time Warner Center at Columbus Circle, Per Se has been on our bucket list since we moved to New York. It was an experience worth waiting for, and one that we will remember forever. From the moment we arrived, the staff made us feel special and welcome. They knew our names, they knew I was a vegetarian, they knew it was Alec’s birthday. They printed special menus with “Happy Birthday Alec” on them. Every tiny detail was perfect. And of course the food was exquisite. 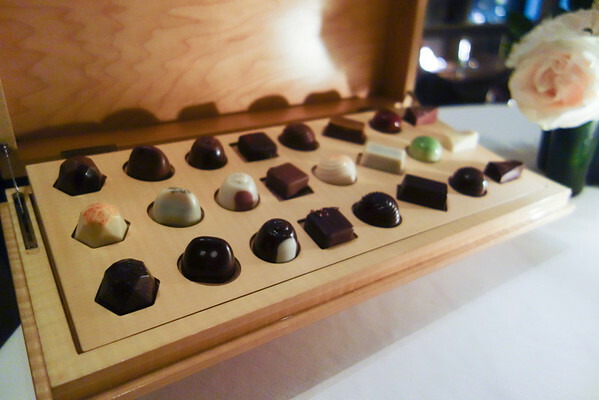 Every course was a tiny delight. 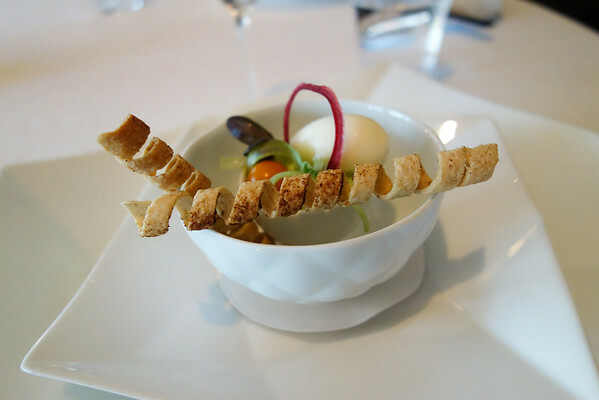 In addition to the courses listed on the menu were various others including amuse bouches, bread, hand-churned butter from a small dairy of 14 cows, extra desserts, a cardamon affogato, macarons, hand-made chocolate truffles and, of course, the famous donuts. All up I think there were about 12 courses. We were so full we had to take home the macarons and chocolates. 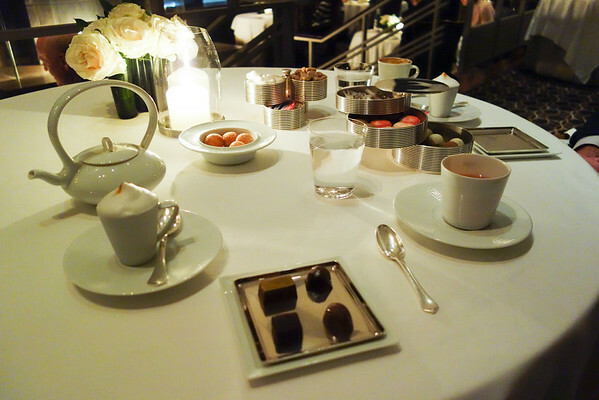 As we left we were handed our especially printed menus in a folder, our boxed up desserts, and sweet little tins filled with the most amazing hazelnut cookies for later. 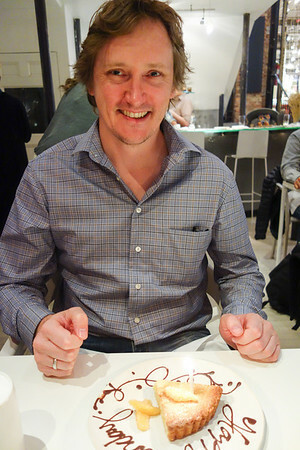 The best meal of our lives, and the most amazing evening. Alec looks eternally youthful to me, with the exception of some tired bags under the eyes thanks to the bad-sleeping Cheese monster. 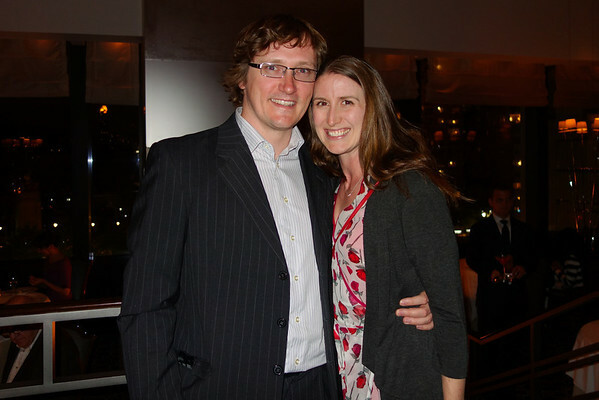 My love, I hope your 40th was wonderful, and here’s to celebrating every day between this and the next birthday. It’s an honor to walk through life with you by my side. You’re a wonderful father and husband. Both the Cheese and I are lucky to have you making up our little family of three. Finally gorgeous weather after seven months of freezing cold. 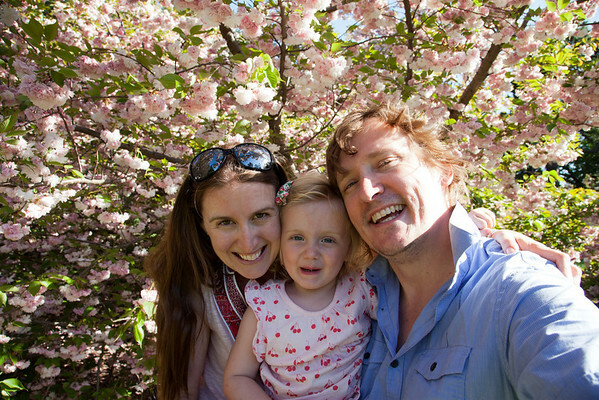 What better way to spend the day with my loves than in the gorgeous New York Botanical Garden? 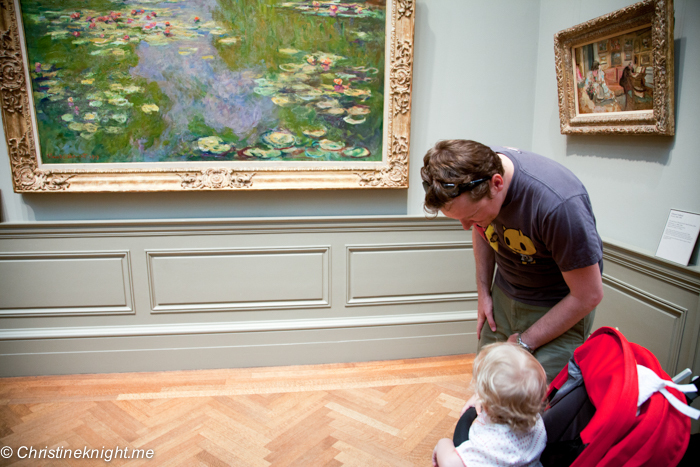 The gardens are way up in the Bronx, so makes it a good day trip for us. 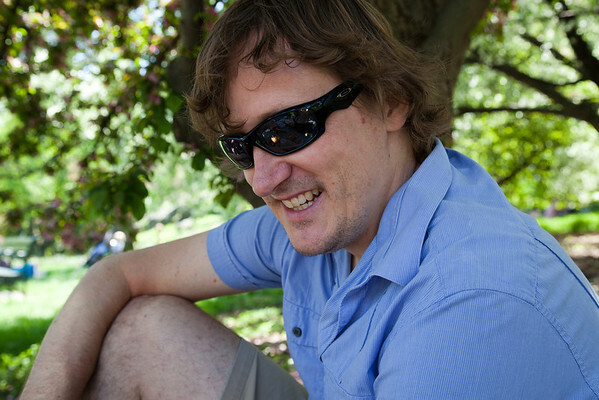 They are extremely relaxed at the gardens, happy for visitors to lounge anywhere and really enjoy the gardens (in contrast to the Brooklyn Botanic Gardens where they won’t let you sit on the lawn! ), so we always pack a blanket and picnic food so we can hopefully spread out under a tree at some stage and enjoy the serenity. The gardens are so easy to get to by train. The B, D or 4 are all nearby, and it’s a short walk from the station to the garden. The gardens are MASSIVE. There is a tram to get around, but we always walk and haven’t found it too large for strolling between each area. 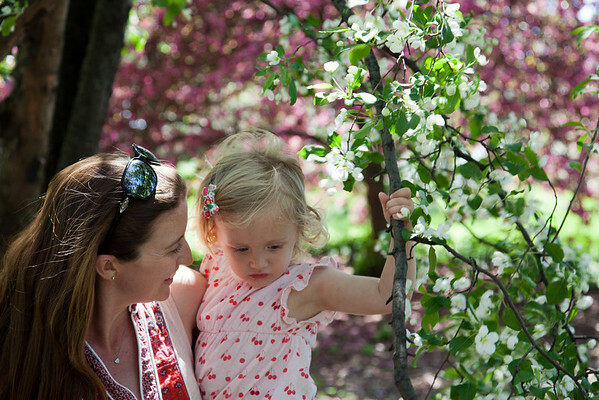 Mother’s Day weekend is the perfect time to visit the garden – the tulips and daffodils were just past peak bloom, but the cherry blossom trees and azaleas were in full bloom and absolutely stunning. 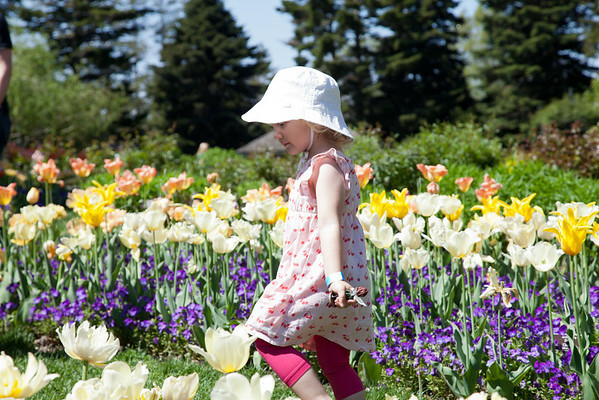 The gardens put on a special Mother’s Day garden party, with a live jazz band, old school lawn games like croquet, kites, and arts for the kids like making cards, baskets for (pretend) bird eggs, and water colour paintings. We grabbed lunch from a food truck (grilled cheese!) and set up under a perfectly flowering cherry blossom tree. Cheese quickly found toddlers nearby to play with, and merrily entertained herself with a little boy the same age collecting and building a house out of sticks. We stopped to listen to the band – Cheese wanted to dance, and so we did! 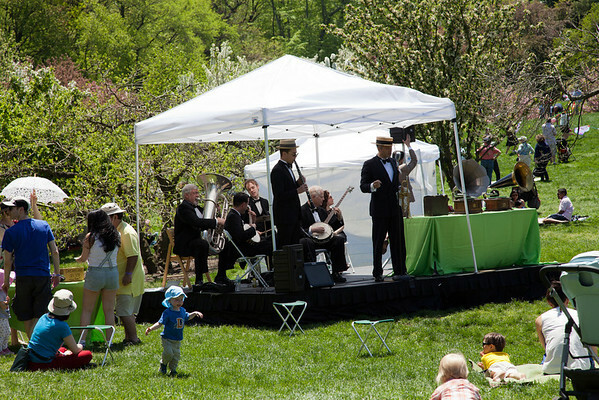 Nothing like dancing to a real vintage jazz band among the gorgeous trees and flowers. A stroll around the gardens after lunch for the Cheese to nap brought us to the exact same spot we paused for a picnic two years ago when we first visited the garden. After the little lady woke up and saw our picnic spread, she proclaimed it “the best picnic ever!” (from Peppa Pig perhaps?). 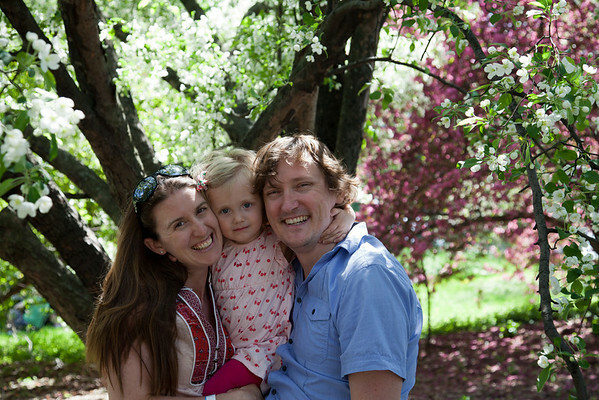 It was the perfect Mother’s Day with my dearest loves, in one of my absolute favourite places in the city I also love. The only thing that could have made the way better was to be celebrating my own mother in person as well. I miss spending time with my parents, particularly on special days like today. Happy Mother’s Day to my amazing mum, and all the wonderful mums in my life and in yours! It’s always a lovely surprise to receive books in the mail. I love reading to E and hope she will end up loving literature as much as I do. 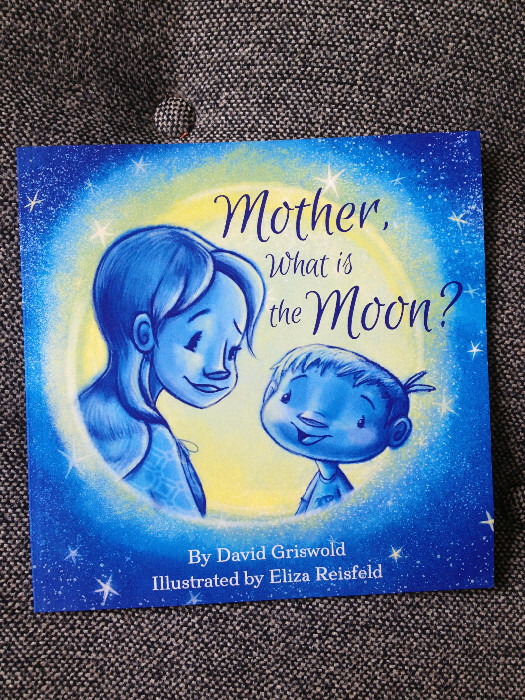 The particular book we are checking out today is Mother, What is the Moon? by David Griswold, and illustrated by Eliza Reisfeld. 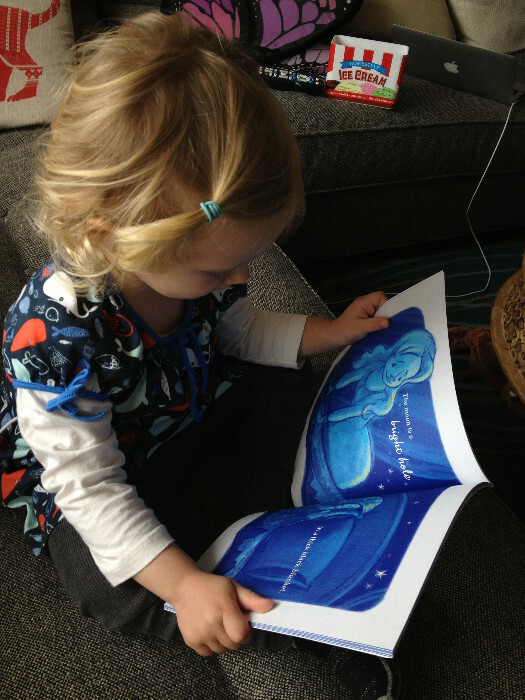 The book is perfect for preschoolers, so if you have a kid aged 2 – 5, read on. Mother, What is the Moon? 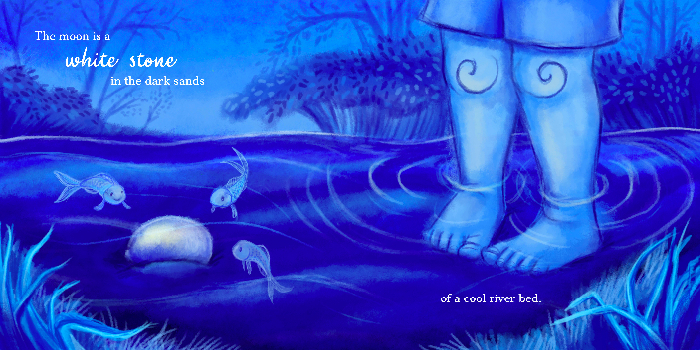 is full of gentle poetry and beautiful art, presented in an engaging way for little ones. 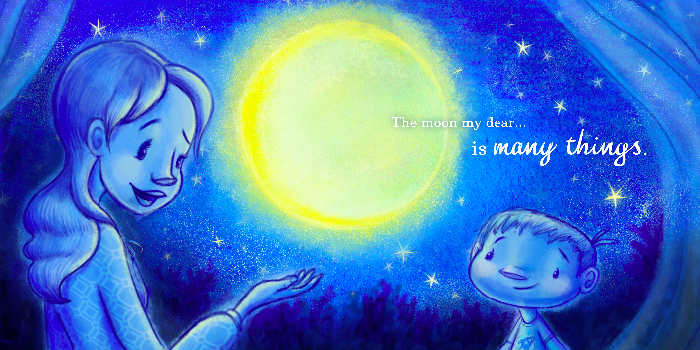 The book tells the story of a young boy, asking his mother what the moon is. Her answer is both wise and whimsical. The moon is a nighttime adventure through snow, fields and streams. It’s connected to the cycle of life and nature, and is a thing of dreams, magic and science, all rolled together. My 2.5 year old is currently obsessed with the moon. Every night, it’s the same. “Where is the moon?” “I can’t see it!” “It’s hiding!” This sweet book gives me a story to tell my toddler that answers the question “what is the moon?” when the moon, like us, is always changing. Mother, What is the Moon? has become a new nighttime favourite in our home, among both the adults and our toddler. If you’re going to read a book a hundred times a week, make sure it’s one you’re all going to enjoy! Mother, What is the Moon? is currently raising funds for its publishing run on Kickstarter. Back it to receive a first edition copy. Brunch With My Baby was not compensated for this post. We just love awesome kids’ books. Rejoice! It is almost Mother’s Day! The Brunch With My Baby team hopes that you’ll be spoiled rotten by your family, and get to enjoy some quality time with your loved ones. Haven’t decided on where to go yet? 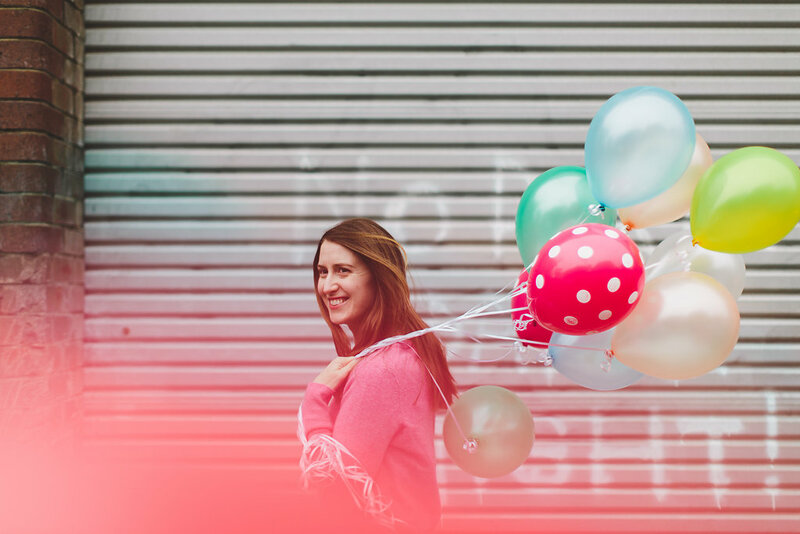 We asked some of our favorite blogger friends for their Mother’s Day plans to give you some last-minute ideas. For our family, Mother’s Day (and Father’s Day!) have become days that we always spend together as a family, but the rule is that my husband and son are in charge of planning something they know I will enjoy (we do the same for Father’s Day, but with me as the planner). 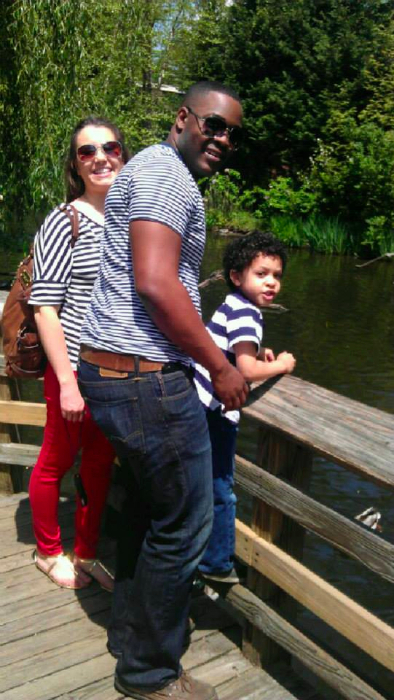 Last year, we spent a wonderfully sunny day at Prospect Park Zoo, which we love because it’s so intimate and friendly. We also do small gifts, which is always fun to look forward to. As my son gets older, many of the gifts become homemade treasures that I value more than anything! 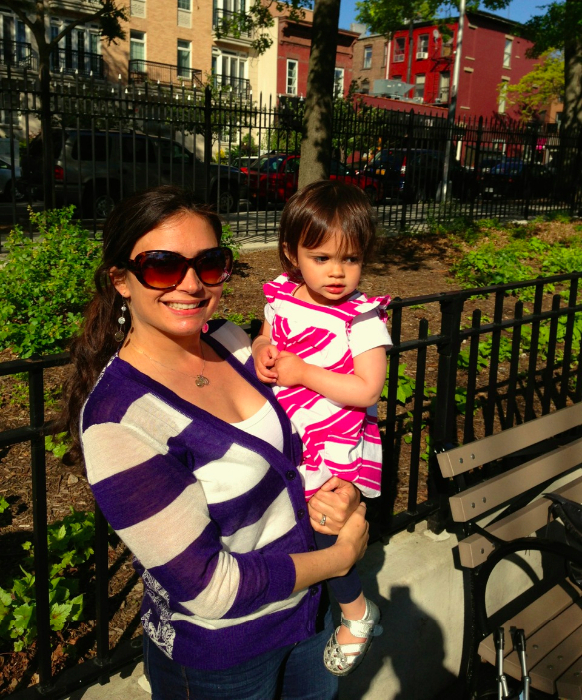 My absolutely favorite thing to do in NYC on Mothers Day is to go to a wonderful brunch with my family! It’s so important to me to spend the day with my 3 children and husband. This year we are actually heading to Langham Place for a fun, family-friendly sing along. I think the kids (and us parents) will have an absolute blast! 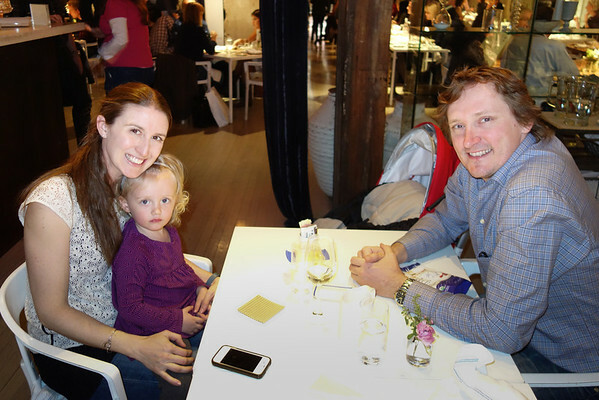 For Mother’s Day, I like to go out for a nice meal with my husband and daughter and enjoy time outside if the weather permits. The restaurants we like (with the perk of outdoor seating) are Du Jour Bakery and Stone Park Cafe. However, I also like to celebrate by taking a little time for myself and getting a manicure and pedicure too! 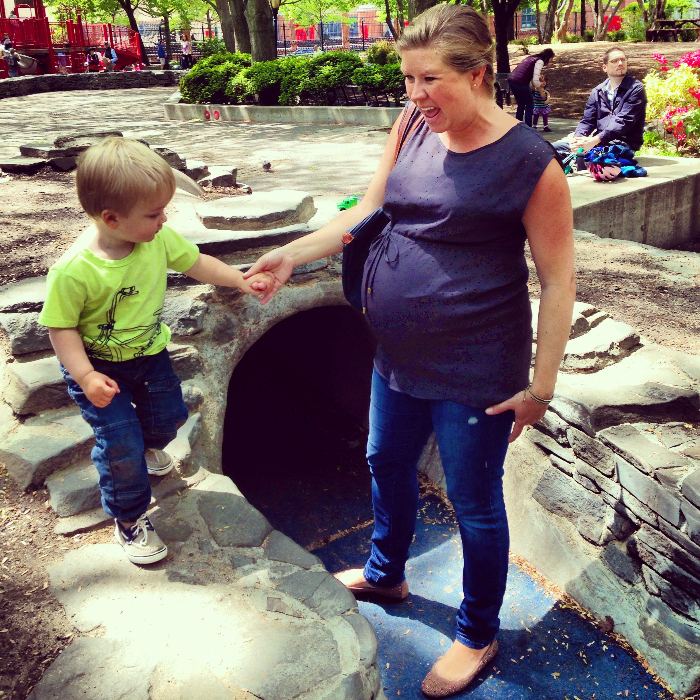 We love the JJ Byrne Playground in Park Slope for outdoor fun, and we also like to go to the Prospect Park Zoo or just for a neighborhood walk. 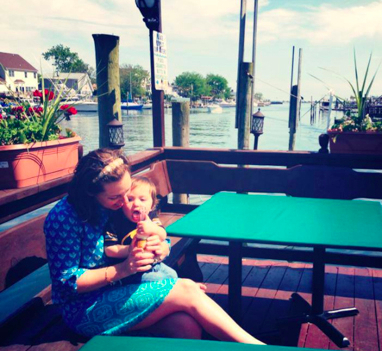 It’s become tradition for us to go to Freeport in Long Island for Mother’s Day — they have the nautical mile which is lined with outdoor ocean/seafood restaurants. You can sit outside on the harbor and have a cold beer and fresh seafood. This year however, we are opting against it since Maximo is so wild and will probably fall off the dock. Stay tuned to see how that plays out! Typically we eat at Otto’s Sea Grill or Rachel’s Waterside Grill. 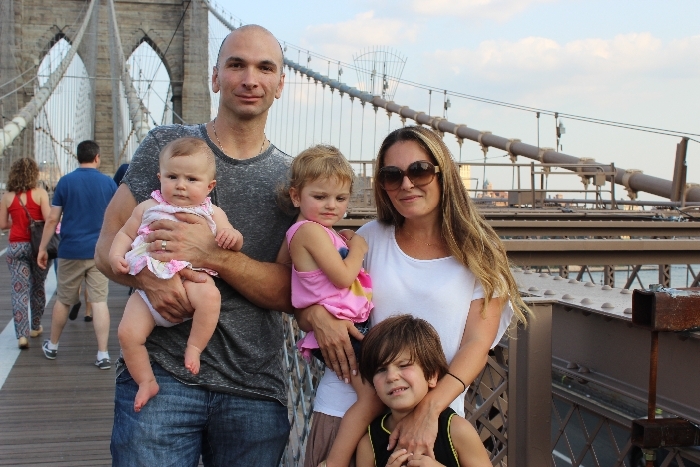 (Check out Stephanie and Maximo last Mother’s Day at Freeport in the pic above!). The Freeport area was significantly damaged during 2012’s hurricane and only re-opened late last year, so the businesses would love your support! 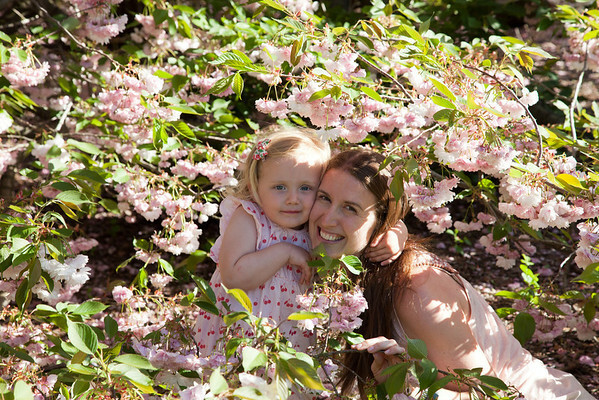 With all of the busyness in my life, I love Mother’s Day as a time to spend time with family. 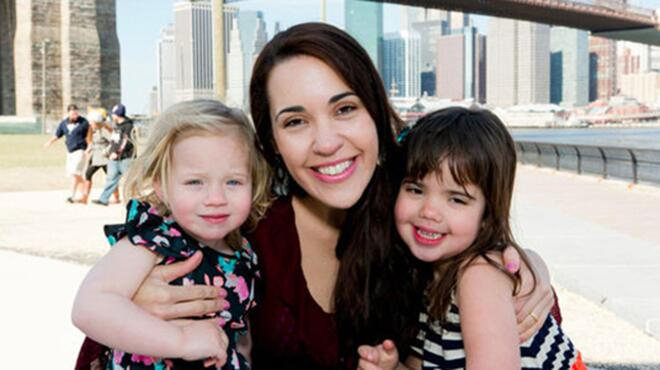 Since I grew up in Bay Ridge Brooklyn, we usually go there to meet my mom and my sister for an early dinner and to visit to the local parks afterward. I also love waking up to the sweet and precious handmade cards that my girls usually make me. There is nothing better (to me) on Mother’s Day then the simplicity of shutting off, eating great food and being with my family. Toddlers are tricky little creatures. While they can indeed walk, they can’t walk for long distances yet, so when going on long outings, some form of transport is still required for them (unless you’re happy to carry them on your shoulders for hours and end up with a serious neck ache). Since Missy E is now over two, she is pretty heavy. 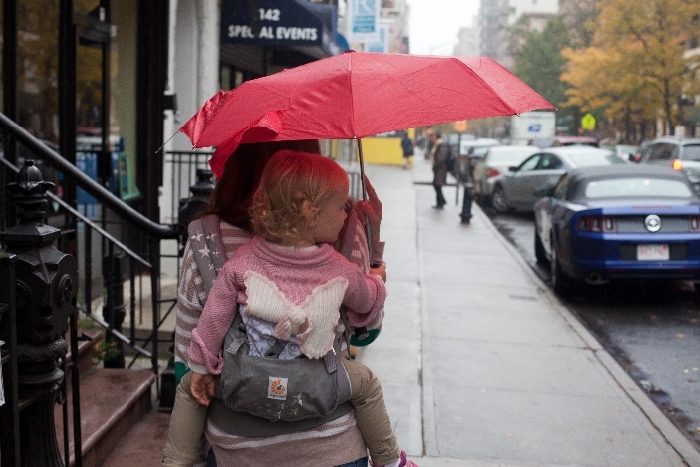 For the most part I throw her in the stroller when we’re going out, but foul weather always tricks me up. Trying to fit the stroller with a rain cover and pushing it while holding an umbrella over myself is always a disaster in the making. Particularly since a certain little person really hates being covered in the stroller. The easiest way for me to get out and about with E in bad weather is still the good ol’ carrier. I also use the carrier if I need my hands free, or know I’ll be taking a lot of stairs and don’t want to haul a stroller around. 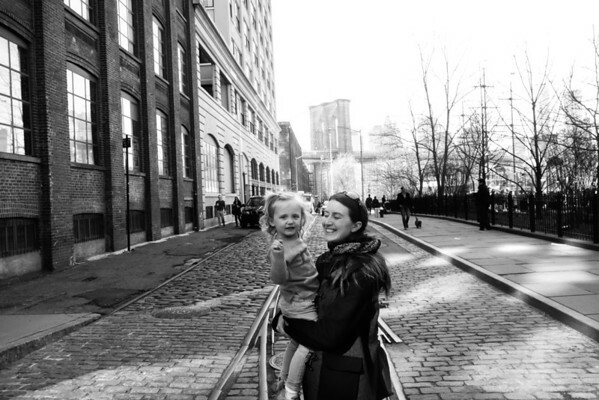 We take a lot of day trips with E where the carrier becomes super handy — like our recent one to the Children’s Museum of Manhattan. Since it was, indeed, raining again, we bundled E up in the carrier (she calls it her “packpack”), and set off, hands-free, for a great indoor play (I mean educational experience …) option with a toddler. The Ergo is really a wonderful carrier. 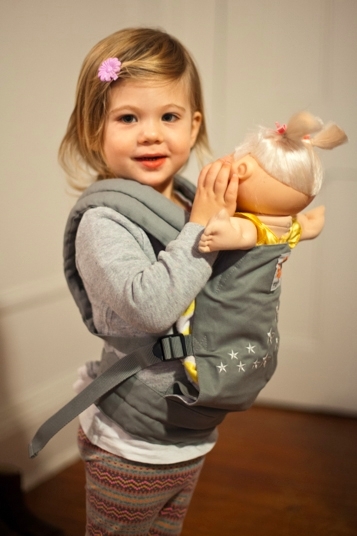 It’s super comfortable, and designed for newborns (when using the infant insert) to children aged four. The Ergo guide recommends wearing toddlers over the age of 24 months on your back (rather than strapped to your stomach), which is what we do now with our big Miss E. Thanks to the padded waist belt, E’s weight is evenly distributed between my hips and shoulders, while the cushy padded shoulder straps mean I don’t end up with massive shoulder pains. The Ergo is designed to carry children in a natural sitting position, which is good for maintaining healthy hips. I’ve carried E in a carrier since she was newborn, so she’s very used to being strapped in. She particularly loves the Ergo because she is really comfortable in her “seat”, and is high up so can see lots of great things at my eye level — like fire trucks when they’re coming from a distance. She occasionally yells “STUCK!” in my ear when she wants to get down, and also enjoys using my hair to play peekaboo with strangers on the subway. A big bonus about carrying an older toddler is they can actually assist in getting into the carrier. To get E into the Ergo, I strap it around my waist and kneel down. I ask her to climb on my back and (most times) she obligingly grabs onto my neck and climbs up. Ell I need to do is reach back for the shoulder straps and clip them together, and we’re off. 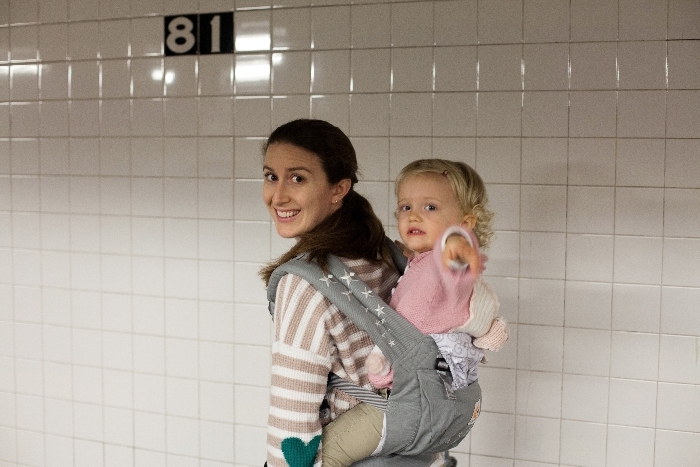 I can even strap her in by myself when I’m on the subway. Carrying E in the Ergo also means I have my hands totally free. Days like this rainy one are suddenly so much easier to manage! It does however begin to pose a problem when the toddler can reach the umbrella and wants to hold it too . . .
Our Ergo is from the Original Collection range, in Galaxy Grey. Other helpful features include a hood, perfect for protecting baby’s head when they’re napping, and a large zippered pouch to throw in keys and cash, so you truly can leave home with your hands free. Upon our arrival at the Children’s Museum, we folded up the Ergo and checked it at the front door. Since it’s all made from material, it folds up really easily into a reasonably small bundle — great for travel or throwing in your diaper bag. 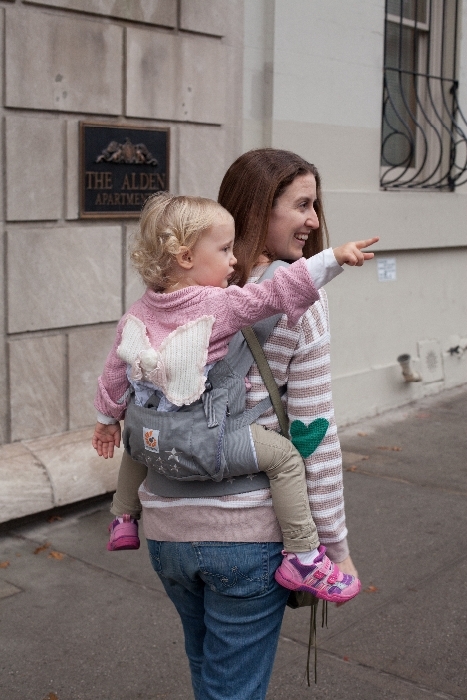 The Ergo carrier is available from the Ergo website for $135 including the infant insert. 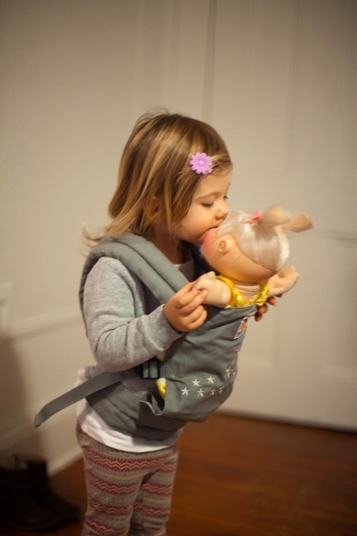 So it’s not surprising that these little girls adore carrying around their baby dolls in their Ergo Doll Carriers. 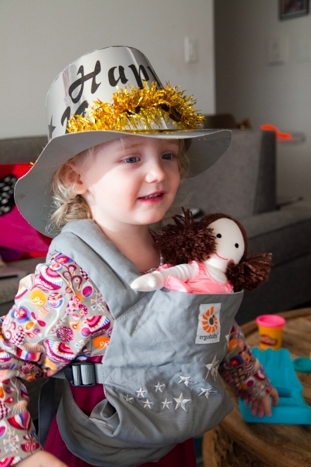 These carriers are perfect for little kids to tote their beloved dolls around town, and make a great gift in particular for a new big sister or brother, so they can be just like Mommy and Daddy. 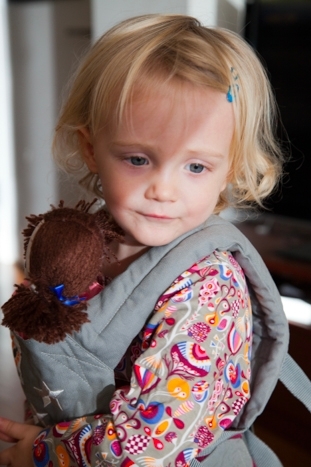 The Doll Carrier can be worn in the front or back position, just like the classic Ergo. 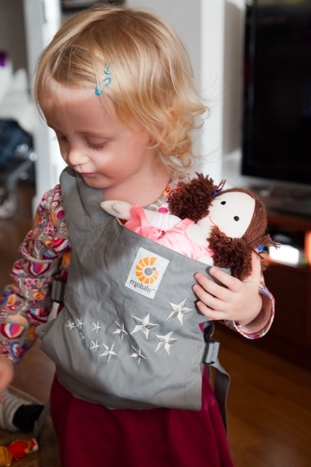 The Ergo Doll Carrier is available on the Ergo website for $25. Spring finally on its way means saying au revoir to giant coats and muted hues, and bonjour to color and fun-in-the-sun again! 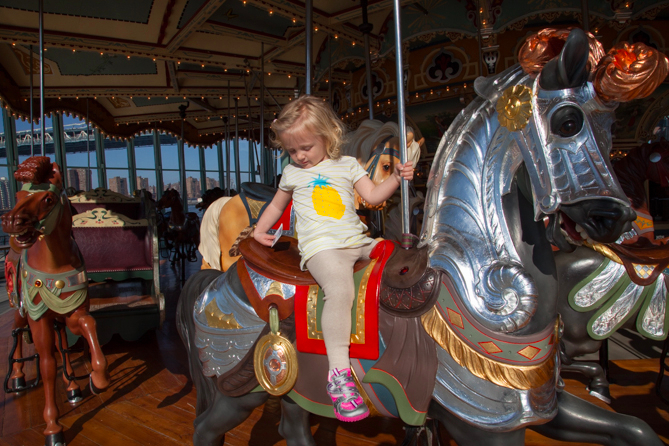 Our absolute favorite place to spend a sunny day in NYC is Jane’s Carousel in Brooklyn. It’s really the perfect playground. 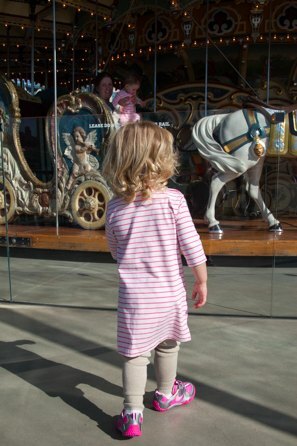 There’s lots of space to run around, grass to kick a ball on, and then, of course, there is the carousel itself. For only $2 per horse, you can take a ride with your little one. 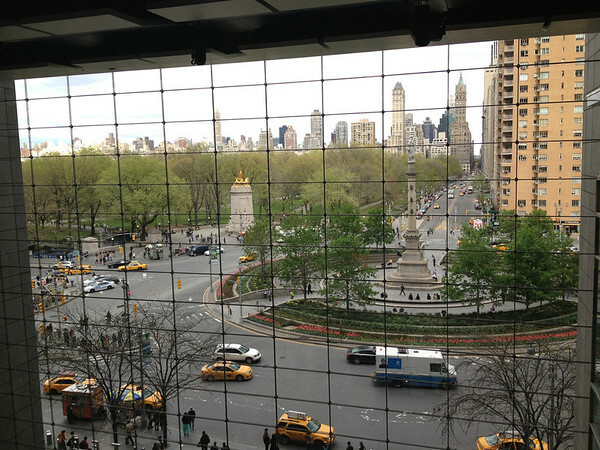 It’s the best value carousel in the city, with the best view. 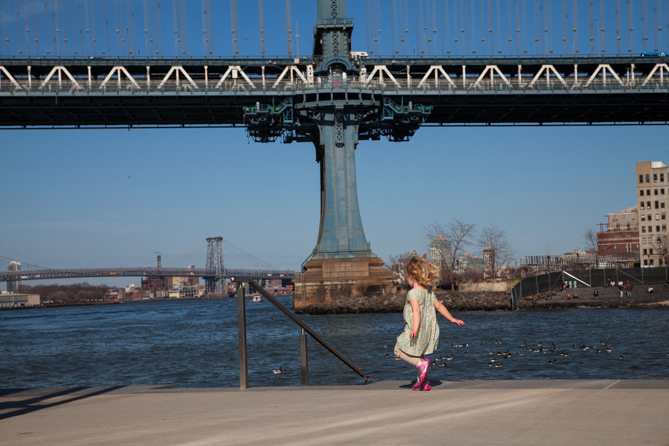 On this particularly perfect spring day in Brooklyn, Missy E wore Egg by designer Susan Lazar. I’ve loved dressing E in Egg since she was a little baby, because the designs are adorable and the fabric is so soft against her skin. Egg hatched in 2003, when Lazar decided to create a lifestyle brand designed around the needs of stylish mothers and children. Egg uses natural fabrics and simple designs. Perfect for parents who love clean lines, and want clothes for their kids that are made with movement and comfort in mind. 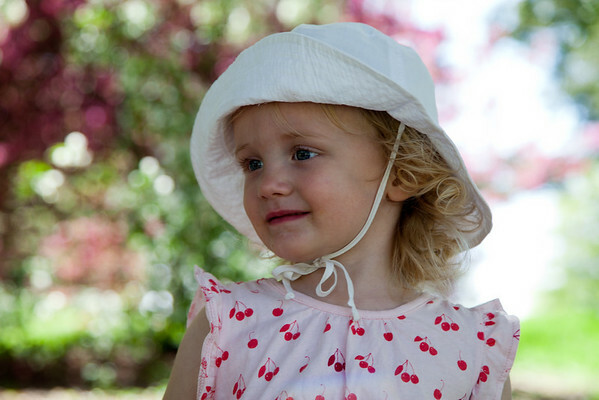 The result is fashionable yet timeless baby and kids’ clothes of the highest quality. 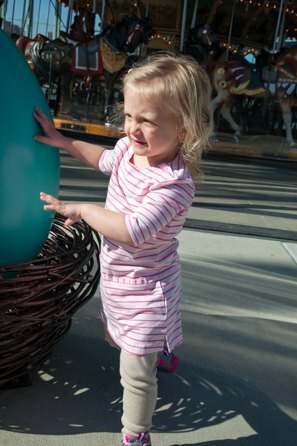 For little ones with sensitive skin, Egg also has an organics line, featuring soft organic cotton. 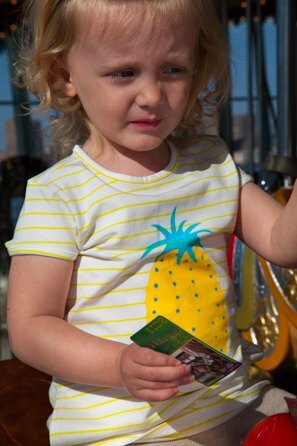 The 2014 Egg spring line is inspired by the South of France, evident in the delicate floral and fruit prints for the girls line, and the cool nautical motifs for boys. The theme of this line, like most of Lazar’s designs, is very subtle — evident in the motifs and colors, but not obvious or gimmicky. “Each season the collection starts with a theme,” she says. “For example, Spring 2014 was inspired by the South of France — the wild flowers, the sea and the chicness of France. The theme is only a starting point and I never want the collection to be too trendy of costume-y”. The end result is a line of clothing that I wish came in my size too. Being such big fans of Egg already, I was really excited to try out three outfits from the new Egg spring line. 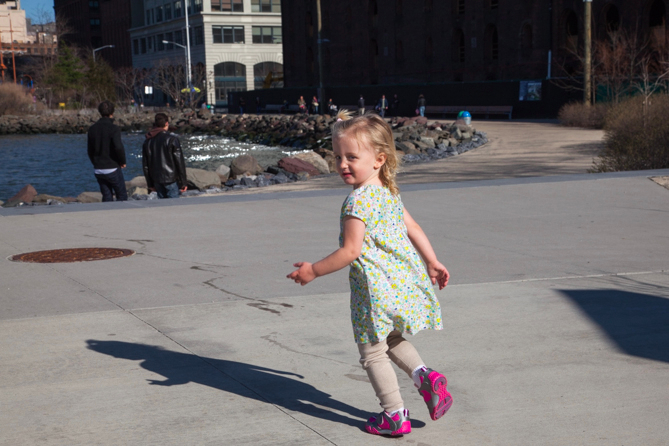 The Shift Dress in pink is made from a super soft cotton-modal blend, perfect for running around town. 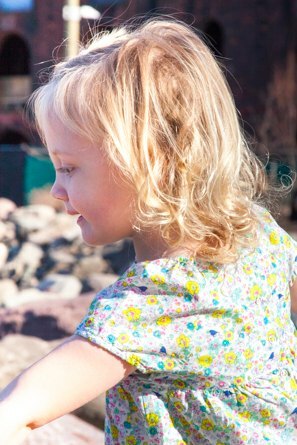 This dress is designed with active kiddos like mine in mind. This super comfortable dress was a hit with E — she adored putting her hands in the double front pockets, and I particularly liked the buttons on the neckline, making it easy to get on and off. The bright pink stripes make this dress fun and bright for spring, while the three-quarter sleeves are the perfect length for days that still hold a hint of chill in the air. The Pocket Dress in green is E’s favourite of the outfits. She loves the delicate floral print, accented with tiny birds, and the floaty skirt with little pockets in which she can hide rocks or other treasures. The dress is incredibly lightweight (perfect for keeping cool in high summer), and is 70% cotton, 30% silk. It looks super chic, but is still extremely comfortable as you can see from the photos of Miss E running, jumping and, her current favorite activity, climbing rocks. 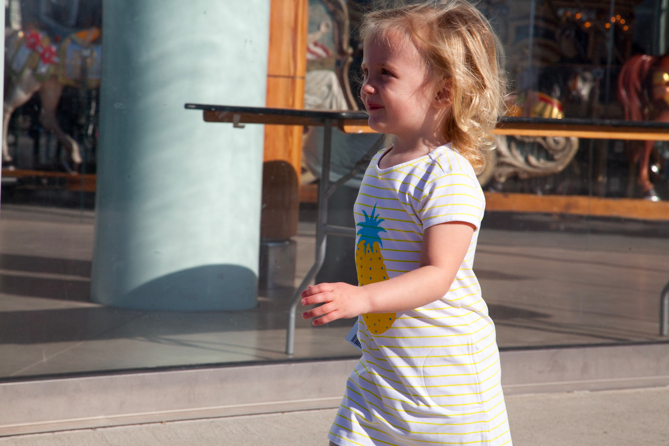 The T-shirt Dress is fun and bright, and perfect for an active toddler. 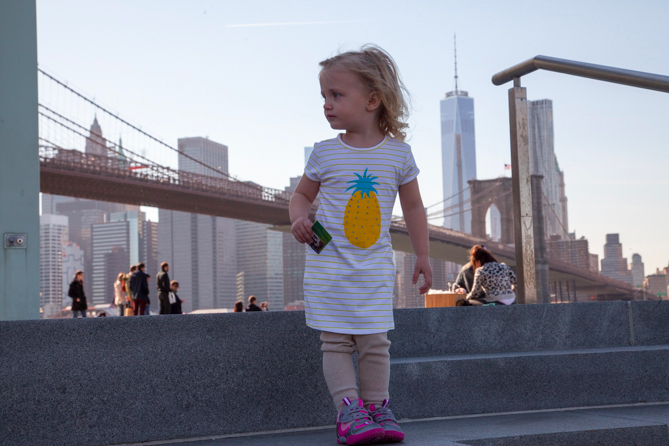 The big yellow pineapple on the front is the standout feature, and is such a cute print that isn’t typically seen on clothes for little kids. 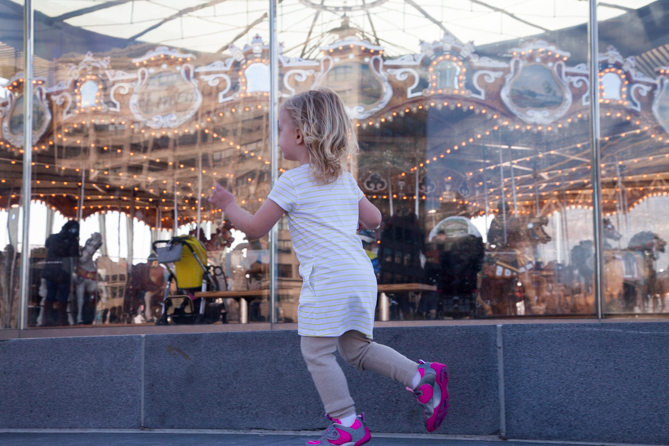 This dress is made for kids who are on the go. Perfect for running, climbing and having fun — being made from a super light weight cotton blend it will last throughout the summer, too. It’s cute without being fussy, and fun without being too “little kid”. Perfect for this sassy baby Brooklynite. The Egg line is available online and in stores. Brunch With My Baby received compensation for this post from Egg. All opinions are, as always, our own.